Given the large size of his original land grant, Elias Keyes’s house probably stood by itself on the terrace above the valley until the early nineteenth century. 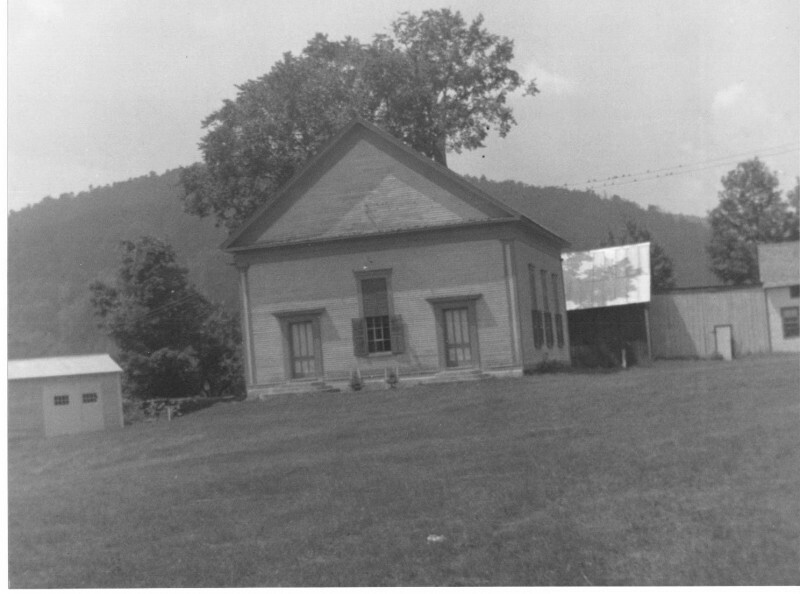 The increasing population in the vicinity, however, brought a need for a local meeting house. In March 1828, Keyes himself leased for $10.00 by indenture to the “Union Meeting House Society in Stockbridge” a small piece of land in front of his former house (then owned by Dr. Timothy Fay, who witnessed the indenture). The document refers to “a certain piece of land lying on the north end of the Common so-called in said Stockbridge being the same which stands a new meeting house belonging to (the) society…” The society was formed in 1827 after Stockbridge residents withdrew from an earlier union society in the adjoining township of Pittsfield. The reference to the “new meeting house” appears to confirm the date of its construction. Other sources, however, give the date as 1836. 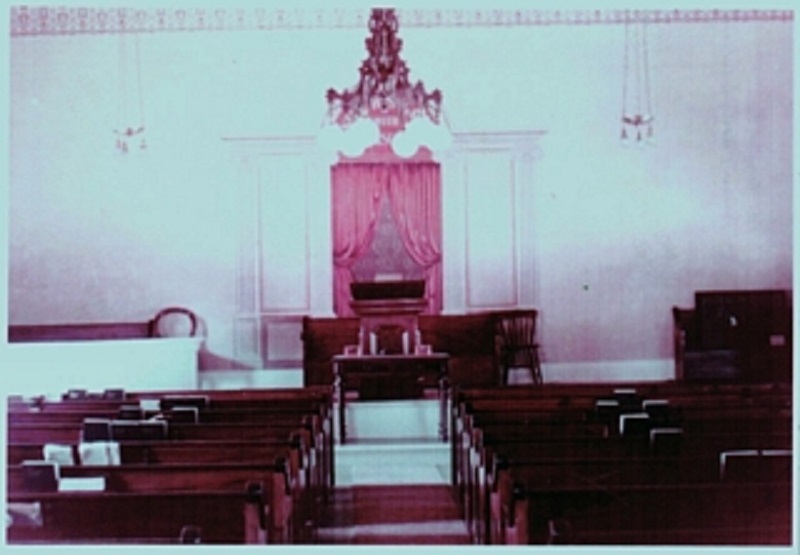 The vernacular Greek revival style of the present Union Church strongly indicates the latter date, if not a later renovation during which the paneled corner pilasters, eaves entablature, gable pediment may have been added to the building. 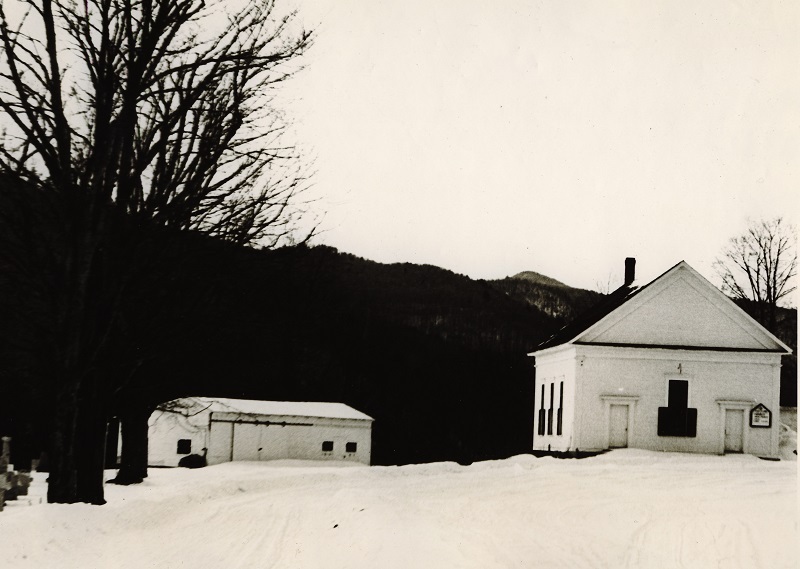 This picture of the interior was taken around 1955.
number of horse sheds for the convenience of the society while attending meetings at the house…” The elongated one-story, gable-roofed horse sheds were constructed in 1837, oriented diagonally to the south side of the church. By 1876, the church had apparently fallen into disrepair. 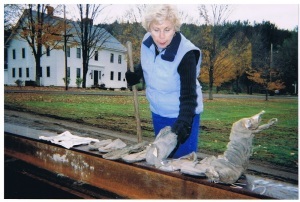 Several meetings were held during the spring of that year to consider the repair or replacement of the building. The decision was made to repair, and the work was performed during the latter half of the same year; the slips (pews) were sold to raise the necessary funds. Following the completion of the repairs, the church was rededicated in February, 1877. Three religious denominations- the Congregationalists-Universalists-and Methodists- then held interests in the church, and a director was elected to represent each society in the management of the church’s affairs. Enos Chandler was chosen director of the Congregational Society but he was succeeded in 1878 by Harvey Morgan. James Baker was then director of the Universalists, and James Bent of the Methodists. Also in 1876, the “Ladies Union Aid Society” was organized; the group would outlive the individual denominations and become the owner of the church during the twentieth century. shutters, and replacement of the front steps. Nevertheless, the church continued to contract in membership and activity. Regular services apparently ceased after the death in 1905 of Rev. Thomas Swan Hubbard, a Congregationalist who had served many years as pastor (resided in the Keyes House, and had been Stockbridge School superintendent as early as 1860). Usage of the church dwindled to the point that it was closed during the winter months. Summer services were conducted by ministers of the three denominations from nearby towns or elsewhere. In 1941, the building was repaired and painted again. The building was moved off its old rubble foundation and placed back on a walk out basement to house the gathering room, kitchen and restrooms. 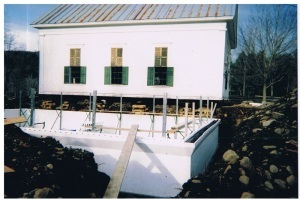 During 2005, the Meeting House received an extensive renovation. This included moving the building off its rubble foundation and replacing it with a full walk out basement which includes a fully appointed kitchen, 2 restrooms and tables and chairs which can accommodate 50 guests. A ramp was added at the back of the building for handicap accessibility to the sanctuary which can seat 150 guests. An interior staircase was added in the entryway to gain access to the Gathering Room. The entire building was rewired and a new furnace was installed. The facility was completely repainted as the last step of renovation. In August 2011, the Meeting House served as an emergency shelter for those needing food and supplies after Hurricane Irene destroyed area roads. events such as Christmas carol singing around an outside lighted tree, and gift giving to all the small children in Stockbridge. Town Meeting is once again held at the Meeting House on the first Tuesday in March. Presenting its temple front to the Common, the one-story, three-by-three-bay, gable-roofed Union Church of rectangular plan displays the basic elements of vernacular Greek revival style. 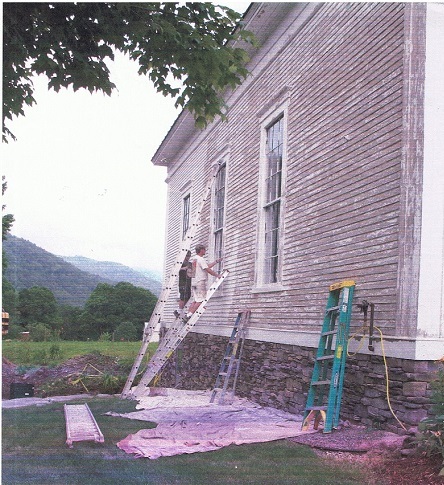 As the restoration neared completion, Mike Shepard was hired to paint the exterior of the building. The matching side (north and south) eaves facades are lighted three regularly spaced bays of windows identical to that on the main facade. Each group of windows identical to that on the west end of each facade, reflecting the interior position of the auditorium; the entrance vestibule lacks windows on these facades. The rear (west) facade contrasts by being blank, and possesses only short horizontal returns of the eaves entablature. An exterior brick chimney bisects this facade, culminating in a corbeled cap. The interior of the church is partitioned into a shallow entrance vestibule with a low ceiling and the auditorium occupying most of the interior space. Three doorways lead from the vestibule into the auditorium; a double-leaf, four-panel doors are aligned with the central longitudinal aisle of the auditorium and flanked by single -leaf doors corresponding in position to the exterior doors. Free standing wood pews occupy the main floor. The wood window and door openings are crowned by cornice caps. Suspended from the center of the ceiling, an elaborate six-lamp metal chandelier of Victorian style has been adapted from oil to electricity.